Anna travels to the Enchanted Forest. She meets David back as shepherd. She tells him a friend says he is trustworthy and needs answers for her secret journey. She insists he call her Joan but he knows she is Kristoff’s fiancée. David frantically sets to work. Anna tells him he must fight back. She slips up telling him that she learned to battle from her soldiers. She wants to teach him to use a sword. David is ready to give up. Anna calls him a coward. He tells her a sad childhood story of how his father lost a battle to alcohol that cost him his life. Anna again encourages David not to quit. The next day David goes to the stable expecting to find Anna. 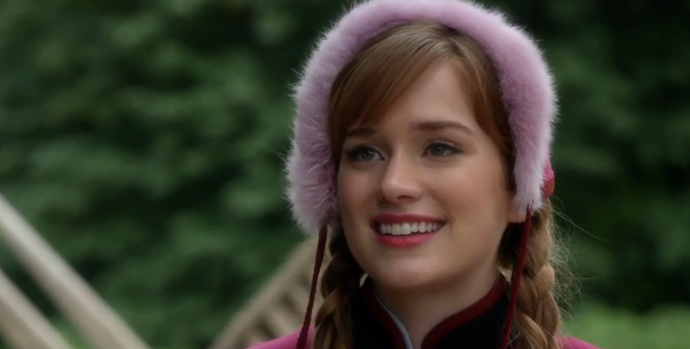 Instead, he finds Bo Peep who now has Anna’s necklace. She tells him she has Anna and has branded her as well. David meets up with Bo Peep again. She is expecting a payment and instead David is prepared to battle her. He is able to overpower Bo Peep and uses her staff to locate Anna. Anna is proud of David for fighting back. Anna is ready to leave for the rest of her journey. David gives her his beloved horse. Ruth is about to send her off with food when Anna asks about the magic in the area. Ruth tells her there is a man who can answer her questions about magic but she cannot bear to say his name. She gives Anna a paper. As the horse carries Anna on the rest of her journey she opens the paper and reads the name. Rumpelstiltskin is delighted to hear her say his name. Elsa leaves Gold’s shop. She vows to put the town on lock down until she finds Anna. Mary puts baby Neal to bed. Emma finds Henry putting together a gift basket for me. A crow comes to the window with a message for Henry. He reads the paper and sadly says I sent him a note that I don’t want to see him. He leaves to the Diner where Emma follows him. She reminds him the note said it was only for now. Emma gets a walkie talkie message and leaves Henry. Leroy, Sleepy and Granny go to Mary. The power is out. Seeing as I am not talking to anyone they tell her she is the new mayor and needs to solve the problem. Hook joins David and Emma who stand before a huge ice structure blocking any way in or out of Storybrooke. Emma goes to check things out. Once alone David wants to discuss Hook’s intentions toward Emma. Emma stumbles upon Elsa who demands to know where Anna is. Hook and David find them, which stresses Elsa causing her to create even more of an ice structure. Elsa and Emma are in an ice enclosure. David radios to them. Elsa grabs the radio from Emma threatening to freeze the town. At the power plant Mary lashes out at Granny, Sleepy and Leroy for pressuring her. They leave Mary and baby Neal. Emma talks to Elsa telling her that she recognizes that Elsa can’t control her own magic. Elsa is also upset she now misplaced Anna’s necklace. After talking Elsa warms up to her but does not believe in herself to be able to free them. She wants Emma to help but Emma is too cold to conjure magic. Emma begins passing out and Elsa tries to keep her awake. David and Hook go to Gold and Belle. They bring them up to speed. Belle pulls out a picture asking if this is the necklace. David recognizes it as belonging to his old friend Anna/Joan. He makes a stop at the Bo Peep’s butcher shop. She refuses to help them so he restrains her while he has Hook take her staff. David and Hook return to Elsa and Emma. He encourages Elsa who is able to create a passage through the ice. Elsa expresses disappointment in herself for endangering Emma. David tells her he will help her find her sister. Mary feels triumphant when she figures out how to turn the power on. She takes the baby home. Emma is home. Henry hugs her. She is in Hook’s arms, which David now says nothing. Mary comes home and meets Elsa. David and Elsa use the staff but cannot see Anna. They do hear a heartbeat so they know she is alive. Henry comes to our home. He stands outside the door yelling that he will not give up on me. I finally open the door and we hug. Emma and Elsa return to the ice structure. Elsa tells Emma that she is the only one with this power. She cannot understand why she cannot melt the structure. Leroy goes for some ice cream. He tells the shop owner he is happy for her that her ice cream did not melt in the power outage. What he does not know is her ice cream did not melt because she is the Ice Queen.